Dolls CollectionaryThisOldDoll focuses exclusively on dolls made in the U.S. during the 30s, 40s and 50s but for those of you who find this too limited, here's a new doll club! At this point most of the information is about new dolls but that will change as they acquire new members. Check it out! Carolyn's Rock'n'Roll Ginny DollsRemember Vogue's Ginny? Of course you do! This amazing site is a virtual museum dedicated to the 50s and 60s Ginny and her friends. It's enormous and has sceens and settings from the Mickey Mouse Club and many other icons of the era we think of as the "Happy Days". Lift your spirits and take a look. Be prepared to spend some time and visit often because there's a lot to see and she's always adding more. Her dolls are gorgeous and some are even for sale! Doll Part Supply A great inventory of items that can be used as-is or with a little immagination and practice, can be made into whatever you need to restore a vintage doll. Whenever I can't find a donor doll, I can find something that will work from Dollsparts! 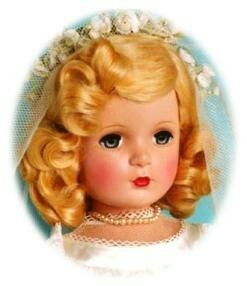 Loretta's Shirley Temple Dolls A fabulous resource for Shirley Temple dolls. 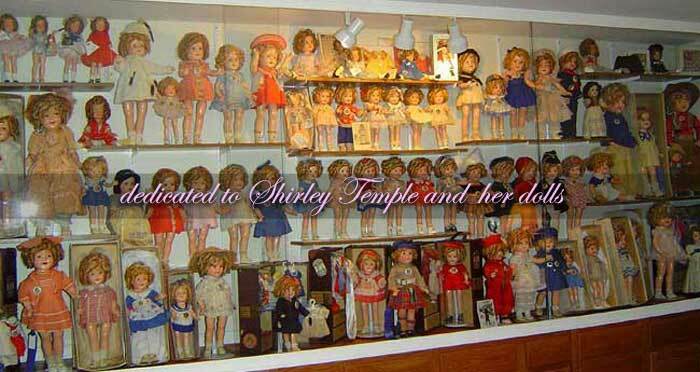 This site will tell everything you could want to learn about composition Shirley Temple dolls and their original outfits. Patti Ulrich of Pattikins who used to make the best reproduction Shirley Temple dresses, is now dedicating her talent to helping others appropriately dress their French fashion dolls. The United Federation of Doll Clubs, IncWant to join a doll club? Want to contact someone in your area who knows about dolls? Check out her past and current on-line catalogs of perfect examples of hard plastic, Madame Alexander dolls from the 50s and 60s. This shop is a wonderful resource for current and discontinued dolls from all the best doll makers. Nice people and good prices, too! Liddle Fashions for DollsNeed an outfit for your American Girl? Write to Lawana. I'll bet she can make just what you need for a very reasonable price! Dollhousecollectables.com is Certified Handley House Retailer and offers a complete line of Dollhouse Kits, Dollhouse Furniture, Dollhouse Accessories, and Dollhouse Supplies.